To me, the name “Merrell” has been associated with dad stuff. Kinda ugly, really traditional, super brown—not the good kind of brown from playing in the dirt, and a little bulky. They’ve never been hip or cool. Until recently. If you showed me a shoe from their new line, I couldn’t tell you it was by Merrell. When Merrell offered to send the #UintasHike16 crew the Capra Bolts, I was a little skeptical. I worship my Salewas. They are my ultimate shoe. I decided to give Merrell a try; if they didn’t make me a convert, at least I could change my tune about the brand as a whole. The Merrell Capra Bolts are constructed with a synthetic and mesh upper and mesh lining, making the shoe extremely breathable, even with thick wool socks on. M-Select Grip outsoles with 4mm lugs deliver durable, highly slip-resistant stability on slippery rocks and ice. Air cushions in the heels absorb shock and add stability. 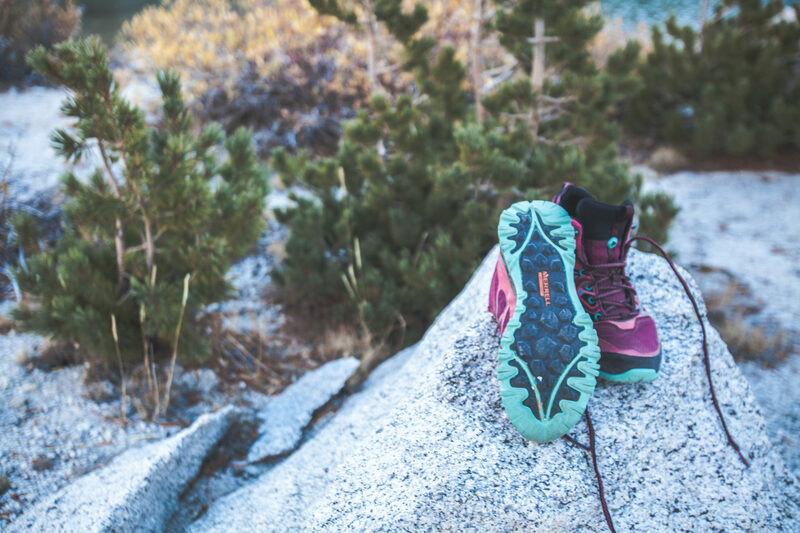 TrailProtect™ pads in the mid-foot offer additional protection against rocks while on the trail. A bellowed tongue keeps out tiny rocks and other debris. The boots weigh about 1lb 8oz. I experienced some hot spots and rubbing around the outer edges of my foot during the first few days of wear but those went away after subsequent wears. After a summer of living in my approach shoes, I missed having that extra sticky climbing rubber. Those my only real “complaints” with the shoe. The Merrell Capra Bolt are an excellent, lightweight hiking boot with ankle support. They’re not a burly shoe, and not my choice for long trips, heavy loads, or really technical terrain. 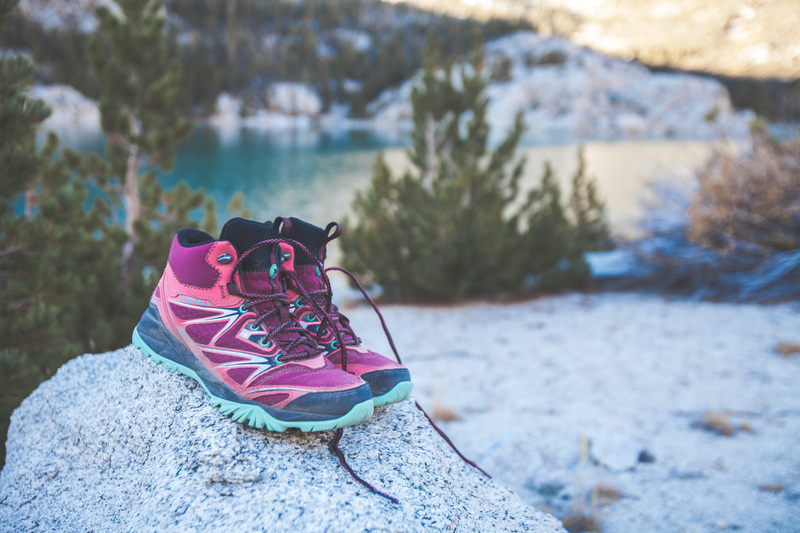 They’re great for day hikes, short backpacking trips, light loads. They also would make a great shoe if you’re trying to wean yourself off more supportive boots. I wouldn’t say I’m a convert, but these are a boot that fits well in my arsenal. I can’t really complain about the color either. The Capra Bolt Mid Boots come in four great colors and retails for $140. 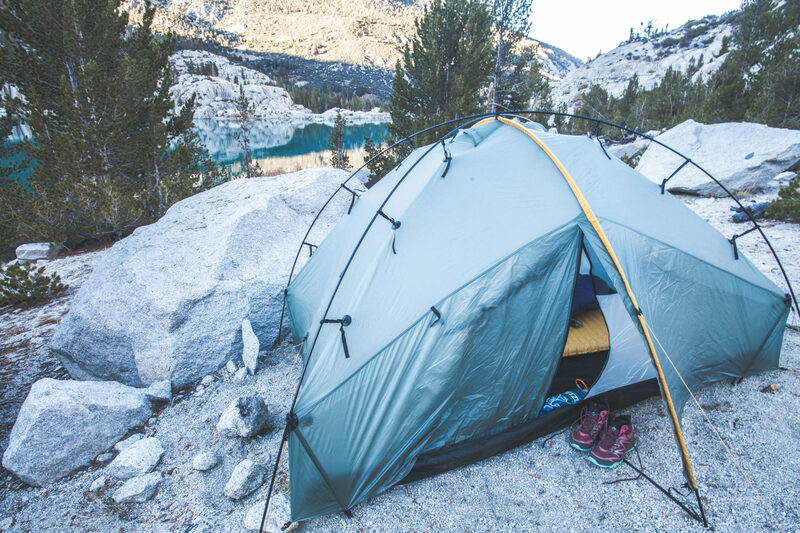 Buy through Merrell, REI, Amazon, or Backcountry. Also available in a low version for $110-130.